Tibet maps from Omnimap, the leading international map store with over 250,000 map titles. Paper Tibet Road and Tibet City Maps. Tibet Geographic Map. 1:2,000,000. Gizimap, Budapest. Part of a series of maps that cover all of China - see also our China page for other maps in this series. Available in two styles - road map and geographic (physical). The geographic version of the map provides excellent representation of physical detail with colour shading and peaks, roads and tourist information such as the location of monasteries, forts and national parks. Names on the map are in English, Chinese and Tibetan. Key to symbols includes German, French, Russian and Hungarian. A full placename index is given on the reverse of the sheet. The road map edition is the same map without the elevation tinting and shading, which makes it easier to read as a road map, but lacks the elevation detail so important in such a mountainous country. Also available flat for framing. Sample of the Tibet geographic map detail. Image of the Tibet geographic map. $14.99 64-40961-5 Tibet geographic map, folded. $19.99 64-40961-5R Tibet geographic map, flat/rolled. $36.99 64-40961-5L Tibet geographic map, laminated. Tibet Road Map. 1:2,000,000. Gizimap, Budapest. Part of a series of maps to eventually cover all of China - see also China listed above. Available in two styles - road map and geographic (physical). The geographic version of the map provides excellent representation of physical detail with colour shading and peaks, roads and tourist information such as the location of monasteries, forts and national parks. Names on the map are in English, Chinese and Tibetan. Key to symbols includes German, French, Russian and Hungarian. A full placename index is given on the reverse of the sheet. The road map edition is the same map without the elevation tinting and shading, which makes it easier to read as a road map, but lacks the elevation detail so important in such a mountainous country. Also available flat for framing. $14.99 65-43903 Tibet road map, folded. $19.99 65-43903R Tibet road map, flat/rolled. $36.99 65-43903L Tibet road map, laminated. Tibet Travel Map. 1:1,500,000. Reise Know-How. A double-sided map dividing the region into north and south sections. Combines clear road and tourist detail with relief indicated by contours, altitude tinting, and selected peak heights. Rivers, salt pans, swamps and ice-caps are clearly indicated. Road detail includes secondary roads, selected tracks and pilgrimage routes and also shows high passes and intermediate driving distances on main roads. Main railways, airports and airfields are indicated and a range of symbols depicts a variety of features such as various antiquities and places of interest, monasteries, temples, sacred sites, festival sites, campsites, viewpoints, hospitals, border control points. National parks and regional boundaries are also marked. Includes extensive index of place names. Longitude and latitude lines are drawn at 1° intervals. A 1:50,000 map of Lhasa is also included, showing main roads and important sites and services. $15.99 65-43905 1 sheet, folded. Tibet Travel Map. 1:1,680,000. ITMB. 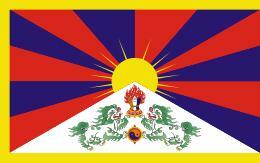 Tibet is fascinating and controversial. It has been occupied by China since Chairman Mao send hordes of Chinese troops into the country and annexed it to China, expanding its borders somewhat by over-running parts of northern India a bit later. At the moment, the Chinese authorities seem to be clamping down on tourism, due to simmering unrest. However, the country, or self-governing province of China is a beautiful place. Printed on ITM plastic for durability. Tibet road map. 1:2,400,000. Himalayan Map House/Nepa. Clear, easy to read map covering the whole of Tibet with all but the south-eastern corner of Nepal. Relief shading, with main peaks and passes prominently marked, indicates the topography. The map shows towns and settlements, roads and local airports. An index of localities includes peaks and passes. The map also includes a street plan of Lhasa indicating places of interest and tourist facilities. $13.95 65-43901 1 sheet, folded. Himalaya & Tibet Map, with Bhutan, Ladakh, and Sikkim. 1:1,600,000. Gecko Maps. Detailed topographic map showing monasteries, pilgrimage routes, sacred places, holy mountains, and much more. With a 1º latitude/longitude grid for GPS use. Map size is 99 x 148 cm. $14.99 65-4372 1 sheet, folded. (Tibet) South Central Tibet (Lhasa Region). 1:900,000. Nepa. 1998. This shaded relief map covers south-central Tibet; the main tourist area. 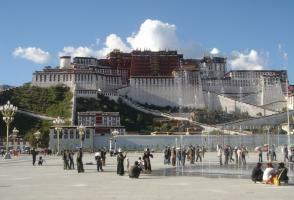 There is also a small, basic map of Lhasa, but we strongly recommend the Lhasa city map listed in our Tibet section. The map shows roads with detailed routes, driving distances, spot elevations, charts of % oxygen at various tourist sites, monthly mean temperatures, and more. We recommend this map of the region. (Tibet) Garze Autonomous Area map. 2001. Bilingual Chinese/English. Map and Index of Lhasa City. 1:12,500. Centre for Occupied Tibet Studies, Amnye Machen Institute, Dharamsala. Cartographical Series #1, 1995. This is an excellent full-color map of Lhasa City. The margins contain a legend and index of buildings, streets, and more. A separate 63-page text booklet gives a brief history of Lhasa and locations of hotels, stores, etc. The map is in English and the text booklet is bilingual English/Tibetan. ISBN 81-86227-10-5. Lhasa City Map. 1:4,000. Gecko Maps. This is an extremely detailed street map of Lhasa with numerous inset maps. The map highlights traditional Tibetan architecture and townscapes. On side of the map has the main map covering the Old Town, Potala, and other main tourist areas of Lhasa. The reverse side has a large map of Lhasa Old Town, plus eleven inset maps of such places as Potala, Marpori, Greater Lhasa, Temple Jokhang, etc. Descriptive text is included for each map. Map size is 20 x 41". $17.99 65-4392LK 1 sheet, folded. Kailash Panorama Map. Gecko. Handpainted picture depicting Mt Kailash and the neighbouring peaks and lakes, as seen from an elevated, north-facing viewpoint. Annotated to highlight peak heights, base camps, settlements and trails. Available either folded or flat. $27.99 65-4374F 1 sheet, folded. $29.99 65-4374R 1 sheet, flat/rolled. Trekking in Tibet Hiking Guide. Mountaineers Books. Features one of the most detailed histories of Tibetan culture and geography available for travelers. Includes a new trekking route over a glaciated 19,300-foot pass used by Heinrich Harrer, author of Seven Years in Tibet. $9.99 67-1070TIB Tibet. Size 4 x 6 in.